If I had to describe Saturday's tournament in one word, I would have to go with "humbling." We had an amazing time with The Escapist crew that turned out for the event, but I didn't fare too well in my matches. I played against three UR (Blue/Red) decks featuring many, many Snapcaster Mages. They all looked something like this. I lost three consecutive matches and we called it a day. I hadn't prepared for UR at all. I knew it existed, but it wasn't really on my radar like Aggro decks were, so I didn't have a game plan to combat it. This is the perfect segue into this week's topic, the metagame. When it comes to playing Magic, nothing exists in a vacuum. You can't know how good your deck is just by solitaire testing, and it always comes down to how you fare against other decks. What other decks, though? This is where the metagame comes in. Whether you're looking at the tournament scene, Magic: the Gathering Online, or just your own playgroup, the various types of decks that other people are playing comprise your metagame. In short, your metagame is the deck types you might expect to see at your next Magic session. My local metagame is wildly diverse. Some players don't have much by way of newer sets, having fairly vintage collections of cards. One Aura deck uses Rabid Wombat to great effect, and another Land Destruction deck utilizes cards from throughout Magic history. Simply by being decks that I play against frequently, though, these are both part of my local metagame. Myr is another deck that exists in my meta, where creature-based mana ramping leads to a 4th turn Myr Battlesphere. Suffice to say, my local metagame doesn't have too much in common with the competitive Standard meta. The closest tie I've found is Illusions, which I'll get to later. When every player is wielding a half dozen decks or more, though, it can be very useful to lump them together based on common themes so you don't end up trying to account for 20 disparate decks when you're preparing for your next Magic games. Aggro is a strategy that aims to win by producing maximum damage output in the shortest number of turns. This strategy often places a heavy emphasis on using creatures as efficient damage sources. Aggro strategies can be slow and relentless or fast and ruthless, in both cases attempting to overwhelm the opponent's defenses and reduce them to 0 life. Control is a strategy that attempts to interfere with, prevent, deny, or otherwise cancel the opponent's actions. It attempts to establish a superior board position and then use that position to win. Combo is a strategy that utilizes the interaction of two or more cards (a "combination") at the same time or in sequence, resulting in a powerful effect. This strategy can also refer to using a single powerful spell to instantly win the game while the rest of the deck is designed to ensure its success. Many decks have smaller, combo-like interactions between their cards, which is better described as synergy. A good combo should be fast (achievable early enough in the game to matter), consistent (regularly achievable), and powerful (so the effect translates into victory). Let's take a look at the decks I've already mentioned and see where they fit in here. The Aura deck likes to ride an enchanted Rabid Wombat to victory. This fits nicely as an Aggro deck. 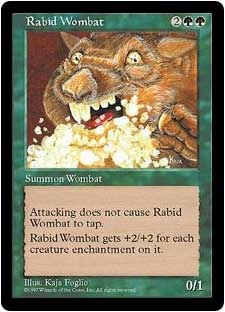 As above, it's not classified as "Combo" because the interaction between Rabid Wombat and Auras is better described as Synergy than as a combo. It aims to be a slower style of Aggro, to be sure, but once they've got a wombat in play and a couple of Auras attached, it's time to beat down the opponent in combat as quickly as possible!